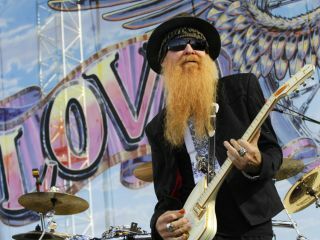 ZZ Top's Billy Gibbons adores playing the guitar. But the celebrated axeman also loves talking about guitars, which he does at length and with considerable humor and insight in this MusicRadar podcast interview. "They say if you can make a living doing with you love, then you're a fortunate man," says Gibbons. "But for me, guitars are an obsession, my raison d'etre. So for me to get paid to indulge in my greatest passion, it goes without saying that I am truly blessed." Underscoring that statement, Gibbons received perhaps the highest blessing a musician could receive, when, as a young man fronting his first band, The Moving Sidewalks, he opened shows for the one and only Jimi Hendrix. Not only was Hendrix impressed by the teenaged Texan's command of the six string, but he called him "America's best young guitar player." "Truly heady stuff," says Gibbons. "And when you've got the man who practically invented or reinvented what the electric guitar can do say such wonderful things about you, you have a responsibility to wear that title with pride and dignity. "The last thing you want to do is let a guy like Jimi down. I hope he's looking down at me and still feeling good about the mighty honor he bestowed upon me." It's safe to say he undoubedtly is. Since Gibbons formed ZZ Top in 1969, along with bassist/vocalist Dusty Hill and drummer Frank Beard, the guitarist has released albums that would define modern electric blues-rock. Tres Hombres, Fandango!, Deguello, Eliminator, Afterburner - they're all classics, and even the introduction of synths and sequences couldn't diminish the down-and-dirty boogie-woogie stomp of "that little band from Texas." Now entering their fifth decade as a band (with a lineup unchanged! ), ZZ Top are currently on a 40-city American tour with Aerosmith - "as fun a time as you're likely to have," says Gibbons - before they turn their attention to what the guitarist excitedly calls "our greatest challenge, and one that could yield incredible magic": a collaboration with producer Rick Rubin for an album scheduled for 2010. In this exclusive MusicRadar podcast, Gibbons talks about the prospect of working with Rubin, along with the possibility of writing with modern-day bluesmen The Black Keys. But as one might expect, guitars dominate the conversation, and Gibbons waxes voluminosly about several of his most prized pieces, most notably Pearl Gates, his treasured 1959 Les Paul (soon to be issued as a tribute model from Gibson) and the mysterious Gibson Moderne. You'll see photos of these guitars on page 2 (along with a rare autographed shot of a young Gibbons with a certain somebody), but in the meantime, sit back, pour yourself a nice cool glass of whatever pleases you and enjoy The MusicRadar podcast with Billy Gibbons.